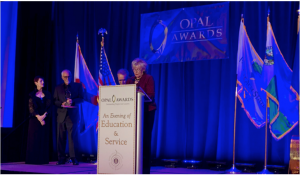 Boca came together to honor eight standouts and collectively raised $220,000 at the 21st annual OPAL Awards. “Because of nights like this, we’re able to provide scholarships,” OPAL co-chairman and auctioneer Neil Saffer told 360 supporters at Boca West Country Club. The Rotary Club of Boca Raton honors Outstanding People and Leaders to raise funds for scholarships and mentoring. In a moving speech, Garsendy St. Fleur described how the club helped him go from a homeless teen to a business major at Florida Atlantic University. Previous scholarship winners Gabriela Heizer, Rivka Averbukh, and Valerie Dutreuil greeted guests and others stood to be recognized. Palm Beach State College Boca Raton provost Dr. Bernadette Russell was among the guests. This year’s OPAL honorees included Place of Hope founder and CEO Charles Bender III. His agency here and in north county house and help abused and neglected foster children. Bender thanked Boca for embracing the agency when it took over and rebuilt The Haven site here. “Let’s build out the campus. Let’s do it together,” he said. Ron Gallatin played “Eight Days a Week” to illustrate how devoted Rabbi David Steinhardt is to his work. Steinhardt just celebrated 25 years at B’nai Torah Congregation. St. Gregory’s Episcopal Church pastor Rev. Andrew Sherman praised his interfaith work and gave the invocation that evening. Aubrey and Sally Struhl were honored for co-founding the Kelly-Strul Emerging Scholars Program with FAU president John and Carolyn Kelly. Kelly attended the event and spoke on their video. For additional pictures and full article please click here.